ST. JOSEPH’S CHURCH represents the story of America and the narrative of many of this nation’s Catholics. Many immigrants came to Hackensack from Poland for a chance to achieve what was unachievable in their native country. To this day the glory that those original founders sought is evident and inspires all who enter St. Joseph’s Church. We owe a great debt of gratitude to those Polish people and to their descendants. In 1895 there was just a small group of about twenty Polish families living in Hackensack. They had to attend Immaculate Conception Church where there was no Polish-speaking priest. The only Polish church was ten miles away in Passaic. As the population of Poles increased, they decided to build a church of their own. By 1907 they had enlisted the aid of the Rev. Valentine Chlebowski, pastor of St. Joseph’s Church in Passaic, to secure archdiocesan authorization for construction of a church. The plans were approved by Bishop John J. O’Connor of the Newark Diocese. Parishioners made donations, additional funds were collected and more money was borrowed from Father Chlebowski. In 1908 a plot of land for the building of the church was purchased at the present site on Hudson Street and Henry Place. According to a church census at the time, there were 105 families in the area who would comprise this predominantly Polish-speaking parish, but many other parishioners were expected from the surrounding 15 towns. The men of the parish, after a hard day’s work in the brickyards, factories and farms, put in many more hours of hard labor digging the foundation. The church was completed in 1909 and blessed by Bishop J. O’Connor. The first Mass was celebrated on Christmas Day, 1909, by Rev. Ignatius Szudrowicz of St.Joseph’s Church in Passaic. The first resident pastor of St. Joseph’s Church in Hackensack was the Rev. Stephan Nowakowski, who came in 1910 and rented a room in a house across the street from the church until the rectory was completed in 1911. The loyalty and sacrifice of its parishioners plus financial help from Polish families in Passaic sustained the parish through those early years. Father Nowakowski resigned the pastorate in 1912 and in March 1912 was succeeded by Rev. Michael Szparka, who effectively directed the affairs and development of the parish during the four years of his pastorate. He added to the church property and organized the Holy Name and Rosary societies as well as the St. Cecilia’s Church Choir. Unfortunately he became ill in 1916, and the needs of the parish were temporarily administered by the Salesian Fathers from Don Bosco. Father Szparka died on June 15, 1916, at the age of 39. In July 1916 he was succeeded by Rev. Joseph Tawczynski, who emphasized and taught religion to the parish children in preparation for their first Holy Communion. Assisted by organist and sexton Stanislaus Dudziec, Rev. Tawczynski organized a program of lay catechists and a Polish language school to help young people retain the culture and tradition of their forebearers. The Men’s Benevolent St. Joseph’s Sokol Society was a major factor in supporting the church as a center of social, fraternal, and cultural activities. Father Tawczynski became very ill in 1928 and retired to his home in Housatonic, Massachusetts. In 1928 he was succeeded by Rev. Julian Roszkowski, who personally canvassed the homes of the parishioners, asking for donations for the upkeep and maintenance of the church during the era of the Great Depression. Mindful of his own and his parishoners̓ Polish heritage, Father Julian provided traditional religious services and devotions of the Polish heritage of which he was proud. He was active in supporting the growth of the St. Cecilia’s Choir, the Sodality of Our Lady and St. Joseph’s Athletic Association, participating publicly in civic, religious and nationalistic events involving church organizations. Through his personal efforts and capable administration, the original parish debt was paid off by 1941. After a brief illness Father Roszkowski died on November 14, 1944. After his death, the affairs of St. Joseph’s Church were administered for a brief period by Rev. Francis J. Majewski, pastor of Sacred Heart Church in Cliffside Park, and then on January 13, 1945, Rev. John Witkiewicz was appointed pastor. It was during his pastorship that the church took on a much-needed new look. He built a new front extension, enlarged the vestibule, added two new stairways and extended the sacristies. The interior was improved with new artwork and stained glass windows as well as new electrical fixtures and flooring. In addition, the church basement was remodeled, improvements were made to the rectory, and two new garages were built. Rev. Witkiewicz observed the silver jubilee anniversary of his priesthood in 1949, and in his honor individual parishioners made generous financial contributions for greater improvements, and a marble statue of St. Joseph was donated and erected in front of the church. During this pastorate, Rev. John Zak and Rev. Leonard Miodowski served as curates for limited periods from 1951 to 1954. Father Witkiewicz became ill and died on June 11, 1954. In the interim period, Father Miodowski served as administrator. Rev. Walter Nazarewicz, who was appointed pastor and sole clergyman on September 11, 1954, brought a new series of changes. A Sunday school for children teaching catechism in the English language was initiated and conducted by the Felician Sisters of Lodi. Extensive repairs and improvements of the church exterior were completed, and a new automatic electric bell ringer was installed. An efficient and spirited administrator, Father Nazarewicz paid off a substantial amount of the parish improvement loan. On June 21, 1957, he celebrated the silver jubilee of his ordination with a Mass of Thanksgiving. On November 6, 1959, St. Joseph’s Church celebrated its first half century with a special Mass of Thanksgiving presided over by Archbishop Thomas A. Boland. According to the records at the time, there were 228 families from Hackensack and fifteen surrounding towns. In the parish about eighty percent were of Polish descent. By that point in time, the church had performed 1612 baptisms, 441 marriages, 417 funerals and 446 confirmations. The parish had four active and participating societies: Holy Name, Rosary, Sodality of Our Lady, and St. Cecilia’s Choir. 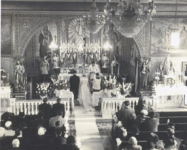 On March 30, 1963, Father Nazarewicz became pastor of St. Stanislaus Kostka Church in Garfield. Rev. Ladislaus J. Czermak was appointed pastor in April 1963 and promptly established a close and amiable relationship with his parishioners. Many social and fund-raising functions were conducted successfully to meet the payments of the improvement loan and the cost of the additional changes. The interior of the church was redecorated, and the grounds were all beautifully landscaped. The interior of the rectory was refurbished. A carillon was installed to memorialize long-time organist and sexton Stanislaus Dudziec. During the next few years the balance of the parish debt plus the assessment for the Archdiocesan Building Fund were paid off and the mortgage burned. Father Czermak became ill suddenly and died on September 8, 1966. Rev. John Kulaga succeeded him in October 1966 and as pastor, he administered conservatively, keeping the parish on an even keel until his transfer to St. Casimir’s Church in Newark in January of 1968. Rev. John Buklad became pastor and served a short time until his appointment as pastor of St. Hedwig’s Church in Elizabeth in October 1968. He was accepted enthusiastically by the young people of the parish and participated in the activities of the Holy Name Society. Necessary improvements to the grounds and replacement of sidewalks were accomplished during his pastorate. On November 1, 1968, Rev. Zbigniew J. Szymanski was appointed to the parish and made several changes in the liturgy and church appearance to conform to the Vatican Council Mandate of 1965. The Eucharistic Altar was erected so that Mass could be said facing the congregation. Mass times were rescheduled, including the addition of the Anticipation Mass on Saturday evening, and lay lectors began to read the Holy Scripture. Also, Holy Mass could now be said in the native language of the people, not only in traditional Latin as was common. In 1973, when the Church allowed national conferences of Catholic bishops to request permission to give the faithful the option of receiving communion in the hand, the U.S. bishops made the request, and St. Joseph Church adopted the practice when permission was granted in the late Seventies. In addition, the church was air-conditioned. When Fr. Szymanski retired in 1988, Rev. Thaddeus Stasik was appointed as pastor. In 1992, Father Stasik was reassigned as pastor of St. Anne’s in Jersey City, and Rev. Martin J. Silver was made pastor of St. Joseph’s. He served until his retirement in 2001, at which time Rev. Marian Spanier was appointed. St. Joseph’s Church has retained many of its beautiful and important religious traditions throughout its history. Food is blessed at Easter in keeping with the longstanding Polish custom. Christmas wafers (Oplatki) are available on the vigil of Christmas. Home blessings of the homes of parishioners by the pastor takes place in January. Although there has been a gradual change in the constituency of the parish, attendance has been constant and supportive in keeping the church in a financially sound and satisfactory position. Presently 235 families are St. Joseph’s parishioners. From a small parish such as ours, we are proud and honored to have two former altar boys go into religious life - Rev. Raymond Zielezienski and Brother Peter Zawot, C.F.C.